Whilst singing bowls are now identified in the Western mind with the music and religious rituals of Tibet, most scholars of the subject accept that Singing Bowls did not originate there.The knowledge of mixing various metals to produce a singing sound was around in Asia from ancient times. Small metal skull-shaped bowls used to produce sound were known around 1100 BC. Finely tuned bells were being produced in China around 600 BC. By 500 BC the study of sound and the effect of vibration were so advanced in China that bronze ‘fountain bowls’ were being produced. These very specifically shaped bowls were filled with water. When rubbed in a special way, the water would rise up and a humming sound would be produced. Bronze bowls have undoubtedly been produced in Himalayan region for centuries. They were widely used as begging bowls, chalices or kitchen bowls, although there appears to be no written historical evidence that they were widely used for the production of sound. Furthermore, there is no evidence that singing bowls formed part of traditional religious practices, as bells other musical instruments are known to have done. However, bronze 'kitchen bowls' have always been highly valued possessions in the homes of Northern India, Nepal and Tibet, and they were passed down from one generation to the next. Western interest in the sound produced by these old bronze bowls seems to have taken hold in the Sixties, as these areas became part of the 'Hippie Trail'. Singing bowls are now produced throughout the Himalayas and India to satisfy demand in the West. At Windhorse imports we personally select all of our singing bowls in Nepal for their quality of sound and resonance. Copper 77.2%, Tin 22%, Lead 0.4%, Zinc 0.01%, Iron 0.14%, Gold 0.01%, Silver 0.03%, and Mercury 0.02%. This mixture, predominantly 78% Copper and 22% Tin, is a form of bronze known in the West as "bell metal". As the name suggests, it been used for centuries in the production of church bells. Alloying the two elements creates a metal which is harder and less ductile, and also one with more elasticity. This allows for a better resonance and causes a bell to vibrate like a spring when struck. In India, this form of bronze is called 'kanh' and 'kansa' and used for cooking and eating utensils, due to its anti-bacterial properties. This explains why historically, so many bronze bowls were produced in the region for kitchen use. By contrast, modern manufacture of singing bowls typically uses five metals at most (excluding gold and silver), and often only two. Even so, there are some excellent quality modern singing bowls available. 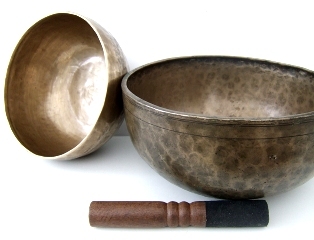 There are two different methods used for the manufacture of singing bowls today. Many are still made by hammering a flat sheet of metal over a form until it becomes the shape of a bowl. The edges are then folded over and hammered smooth. In modern production the inside is often machine polished. Hammered bowls are easily recognisable from the hammer marks on the outside. These traditionally manufactured bowls are often insisted upon by purists. Hammered bowls are often sold as ‘old’ or ‘antique’. There are indeed old bowls still around, although the actual date of manufacture of a bowl is seldom proven, and new bowls are often aged artificially. More recently many bowls are made by pouring molten metal into a mould. Most of these "cast" bowls are actually made in two pieces, the bowl and the neck, which are then welded together. The bowls are then highly polished. This method allows the more ‘enclosed’ shapes to be produced, resulting in an improved tonal quality and longer lasting sound. As cast bowls are very smooth when finished, they can be decorated by acid etching or even enamelling. The smooth edges also make them easier to play. There are many different shapes of singing bowls. The sound is determined by the shape of the bowl, the mix of metals used and the thickness of the material, as well as the thickness of the rim. Although the way the Himalayan people used these bowls is open to question, one thing is certain - Westerners are often affected in a particular way when they hear the unique sound of a singing bowl for the first time. The resonances cannot be reproduced by any instrument in Western culture, nor can a recording of the sound produce the same effect. Many people feel their spirit has been touched when they hear the sound. Increasingly, sound therapy is being used in healing. Powerful vibrations emanate from a singing bowl when it is played, and these can spread quickly through the cells of the body. 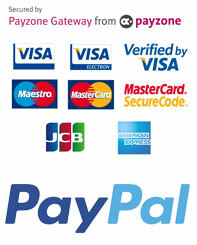 Physiotherapists also make use of the phenomena of internal massage with ultra-sonic sound waves. It is claimed that the harmonic frequencies of singing bowls can be used to stimulate the natural harmonic frequencies of different parts of the body. Mystics throughout the ages have used music and chanting to achieve altered states of consciousness. The normal state of the brain produces Beta waves, whilst Alpha waves are present when the brain is in a state of meditation and calm. The sound wave pattern produced by some singing bowls is equivalent to the alpha waves produced in the brain. These bowls can induce a sense of deep relaxation and access to the inner self. Furthermore, healers and mystics often the powerful vibrations of the singing bowl to clear negative energies within a room. People sometimes pick up a bowl for the first time believing that there must be a special skill required to play it. However they soon find that after just a few minutes of handling the bowl, and by following a few simple instructions, the beautiful sound can be produced. Resting the bowl in the palm of your hand will better enable you to appreciate the experience than by putting it on a table. Keep your fingers outstretched so that they do not touch the bowl and interfere with its vibration. Hold the striker firmly as if were a pen. Gently tap the bowl to begin and then firmly and slowly run the striker around the outer rim using constant pressure. Some advocate using an action similar to stirring soup, keeping the wrist straight, whilst others prefer a free rotating wrist action. After a little practice the user will quickly learn that slightly different sounds can be produced by altering the pressure or speed of the action, or by playing a lower part of the bowl, or by using a different striker. The ‘rattling’ sometimes produced can be eliminated by altering the speed of the action, or particularly in the case of hammered bowls, by using a leather-covered striker. Singing bowls can also be used as gongs and played by striking them with a mallet to produce percussive, pulsating tones.